Cookie’s Cash: Going on Now! How do I earn Cookie’s Cash? 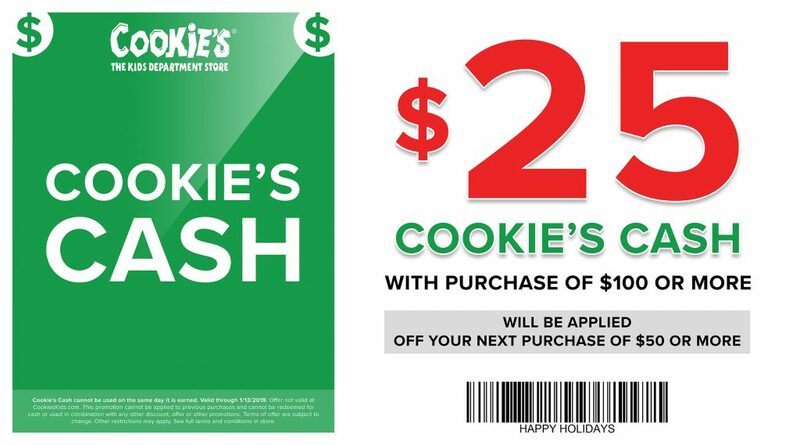 Every customer who purchases $100 or more of merchandise in-store will receive $25 worth of Cookie’s Cash. How do I use my Cookie’s Cash? Your Cookie’s Cash may be used on any in-store purchase of $50 or more. When can I use my Cookie’s Cash? You may use your Cookie’s Cash the day after you receive it! Your Cookie’s Cash is valid until 1/13/2019. Cookie’s Cash cannot be used on the same day it is earned. Valid through 1/13/2019. Limit one Cookie’s Cash per transaction. Valid at Cookie’s Kids stores only; offer not valid at Cookieskids.com. Certain product exclusions may apply. This promotion cannot be applied to previous purchases and cannot be redeemed for cash or used in combination with any other discount, offer or other promotions. Terms of offer are subject to change. Other restrictions may apply. Offer: The value of your regular-price merchandise must total more than $100 before tax to qualify for Cookie’s Cash. 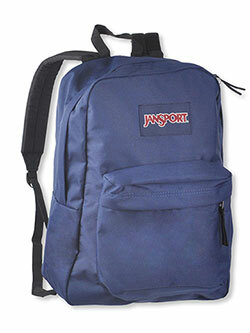 Cookie’s Cash is valid on purchases of $50 or more during the offer period. Exclusions: Cookie’s Cash cannot be used on prior purchases, the purchase of Cookie’s Kids Gift Cards and/or any layaway transactions. Amounts spent above the qualified level will not qualify for additional Cookie’s Cash. Cookie’s Kids employees are not eligible to receive Cookie’s Cash. Exchanged Merchandise: Applicable exchanges will be subtracted from the qualified submitted sales, and any Cookie’s Cash earned may be voided.